Have you been licking your chops in anticipation for a Thanksgiving Day feast? I know my family sure has. Last month my children started asking me about when the family would be getting together. We all enjoy the family time, the feeling of thankfulness and delicious food. I have been so very busy and my husband works a lot. The idea of spending all day slaving before a stove doesn't sound like the relaxing Thanksgiving Day I am looking forward to. Most of you have probably heard of or driven by The HoneyBaked Ham Company. I myself have heard tales of their amazing ham, sides and desserts. I've never actually consumed a ham from there but I've been told it is simply the best. From the name of the store I never would have guessed it myself but did you know that they make turkey? 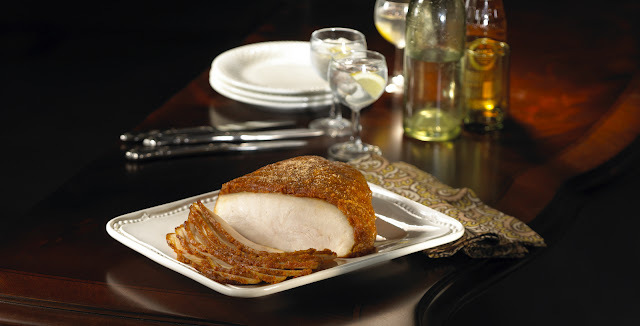 HoneyBaked carries whole turkey, roast turkey with gravy and a glazed turkey that comes roasted or smoked covered in a crunchy glaze. The other day my family tried out The HoneyBaked Ham Company glazed roasted turkey from the Grand Rapids Michigan location. We placed an order for our sides, dessert and turkey and then selected the pick up date and time. It was easy as pie to drive to our closest store location and pick up our meal. All I did was walk in, a friendly person greeted me at the counter to grab my order. I walked out with our feast inside two big bags. Everything precooked and ready to just be heated or thawed. I stowed my bags in the fridge and the next evening we were ready to enjoy our special meal. First thing I did was pull the glazed turkey out and leave it on the counter. The turkey needs to hang out for about 30 minutes as it comes to room temperature. The next thing I did was toss the sides into the oven. It doesn't take long to heat the sides up at all. Once everything was heated all I had to do was set the table and call the fam to the table. I had our meal ready in 30 minutes! The glaze was crunchy sweet goodness. I loved the sweet spice flavor so much that I could have just peeled that glaze layer off and eaten it like a snack. I'd never tasted a roast turkey quite like this before and neither had my family. It is a very unique taste that reminds me of ham. The turkey was very tender and moist. Every bite melted in our mouths. It felt nice to sit there and relax with my family rather than feel sweaty and tired from cooking a turkey all day. The turkey portion for our meal for 4 was very generous. There was more than enough turkey for everyone in our family of five to have seconds. The sides I had chosen were garlic mashed potatoes and the green bean casserole. Both sides were just as good if not better than home made. I don't think I have ever in my life had a green bean casserole that was so perfect. We are talking creamy sauce, fresh and slightly crunchy green beans topped with crispy french fried onions. The mashed potatoes were also creamy, thick and buttery. I have to say better than mom's but don't tell her! No salt or pepper needed. Our finally bites were creamy cheese cake from The HoneyBaked Ham Company. Every creamy bite had my family ooh-ing and ahh-ing. They are begging me to go back for more! The kids said that they want The HoneyBaked Ham Company turkey every year. HoneyBaked is proud to be a family tradition for more than 40 years. More than just holiday time, HoneyBaked knows that memories are made every day. While HoneyBaked has been selling turkey for more than 20 years, this year, they reformulated this product and the new recipe is more tender and flavorful than ever.